This week, we ate quite simply, but it was delicious! We were camping at the beach all week, but we came back and forth several times, using home as our landing spot, so to speak. We did this because Patsy had an event she wanted to attend with the church youth group that lasted 2 nights, and Lovana was flying in from Hawaii. It was up to us to ferry everyone back and forth. So, several meals were eaten in the car, from items packed in a small cooler. Others were eaten at home from odds and ends we dug up, and the rest were eaten in the camper at the beach. 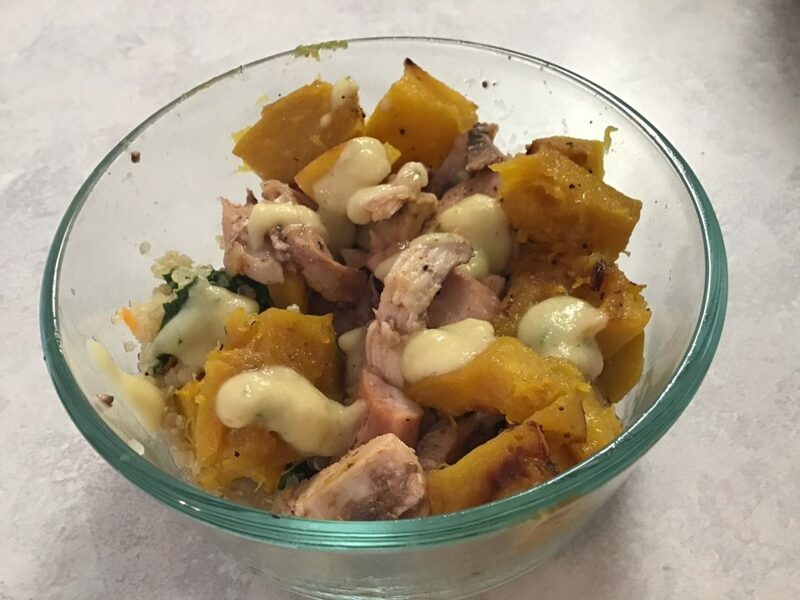 I had made and frozen split pea soup, packed potato salad and chicken for the first day, and had plenty of veggies and salad fixings. We bought salad shrimp twice and I had hard boiled eggs as well. 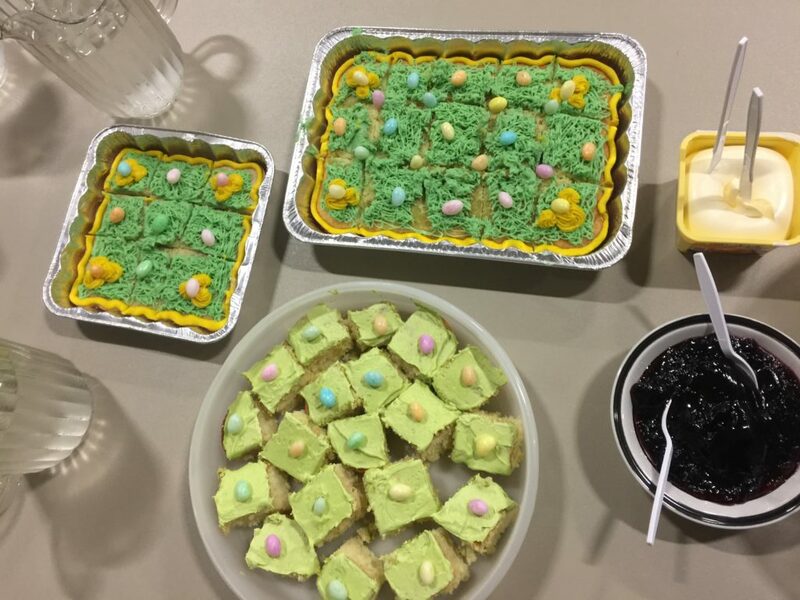 We used home-canned soup and beans and made a lot of eggs and pancakes. We like it simple when we are camping. I took the opportunity to sort through the camper cupboards and pulled out mixes, rice, and other items that had been there longer than I like. I brought in the things I didn’t use on the trip, and I’m systematically sorting them–they are getting used very soon, or discarded if they are no good. I’m going to replace several items before we go camping again, either from the store, or from my cupboards at home. We had a good time, rested a lot, visited with Lovana, and took a lot of naps. I was able to get down and walk on the beach several times. Although the weather was not sunny all the time and we had a few super rainy days, there were plenty of good-weather days, as well. We got home yesterday, and hit the ground running. 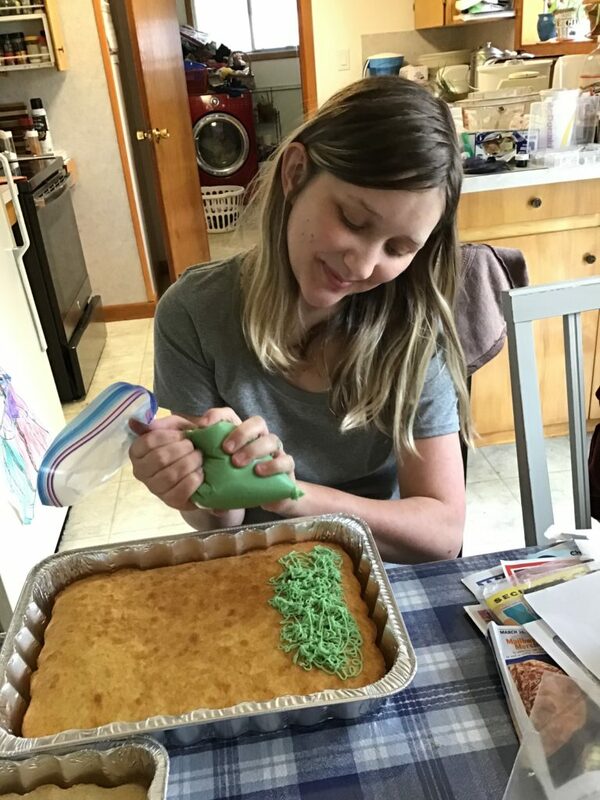 Lovana is off visiting some of her many friends, and I’m cooking up a storm so we can have a big birthday party after church tomorrow for her. It should be fun! 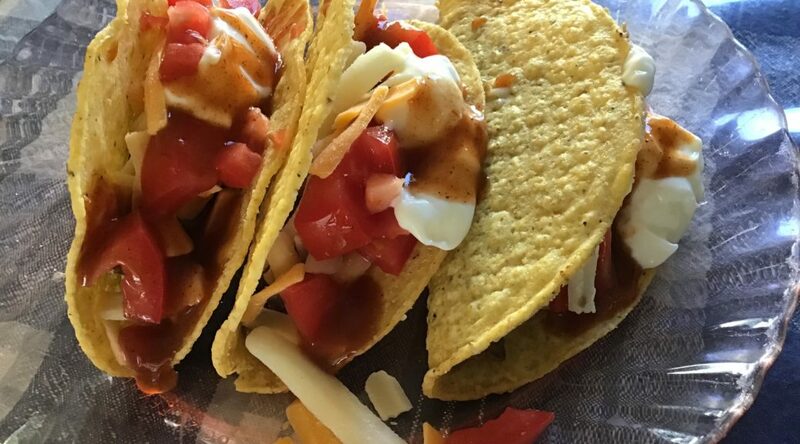 The main, stand-out new recipe I made this week was lentil tacos. 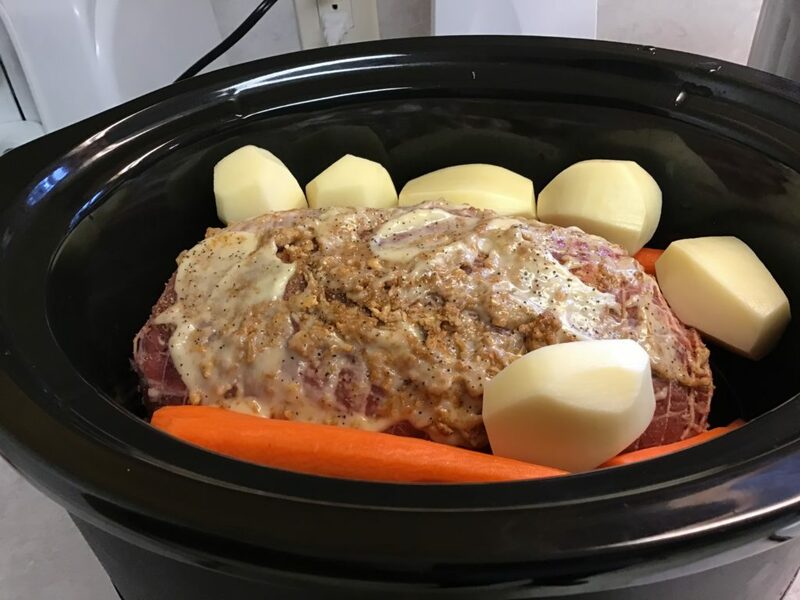 I made them in the Instant Pot, using a recipe from the internet. (There are several recipes, which are all about the same on there). It’s just lentils, salsa, onion powder, garlic powder, chili powder, cumin, salt and pepper, and water. Rob really liked them, also. I made potato salad, Rob grilled chicken a couple of times, and we had as many leftovers as we could eat to clean the fridge. Of course salads were frequent, as always. We’ve been eating a lot of soup, and had turkey-vegetable and chicken-rice several times. It wasn’t a super exciting food week, but there was plenty to eat! Some weeks are just ordinary and this was one of them. On Wednesday morning, I had a few hours. I made 3 kinds of soup–split pea, chicken-rice, and vegetable-chicken. I used the broth and bits from the Costco chicken to make the 2 chicken kinds, so they have very little meat in them, but still taste really good. 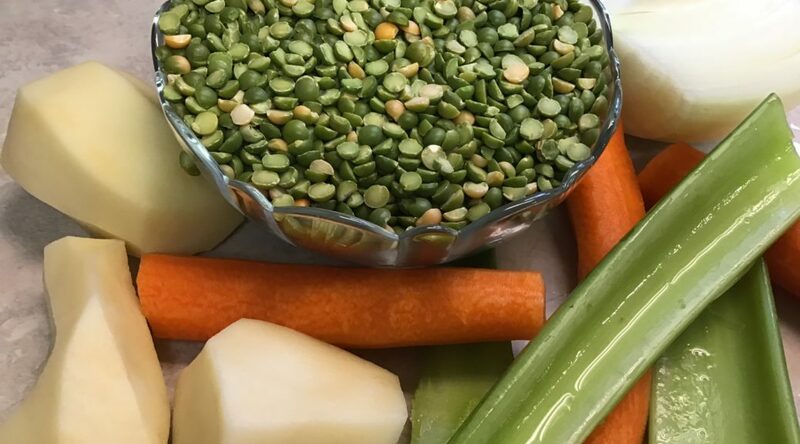 The split pea is vegetarian. I hauled some of the chicken-rice soup over to Jake, who ate it for dinner the next 2 nights. His mouth is healing, but slowly. The second set of antibiotics helped him heal more, but he had a very rough time of it for a few days. 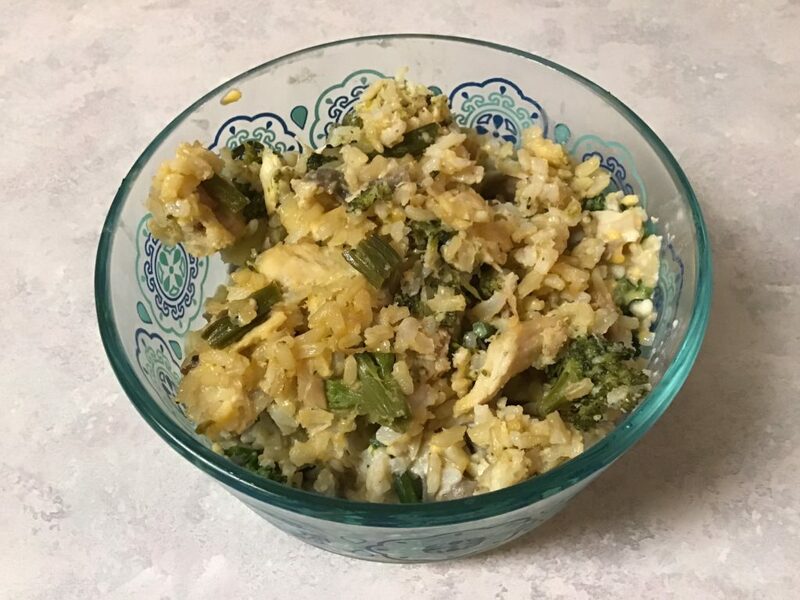 On Wednesday morning, I cooked up an Instant Pot of brown rice. Part of it was combined with frozen turkey bits, broccoli from last year’s garden, cheese, and a sauce made from milk, sweet rice flour to slightly thicken it, dried onion, a can of mushrooms, salt and pepper. It was really, really good. I took some of it over to my sister’s for Thursday night’s dinner. My aunt brought over some salad fixings she wasn’t going to be able to use up before they went bad, and we made salad to go with the casserole. The rest of the brown rice was combined with previously cooked and frozen pinto beans (thawed out of course), cheese (including some Cojita cheese I got for my Friday Freebie a couple of weeks ago), salsa and a little enchilada sauce, both home-canned last summer. 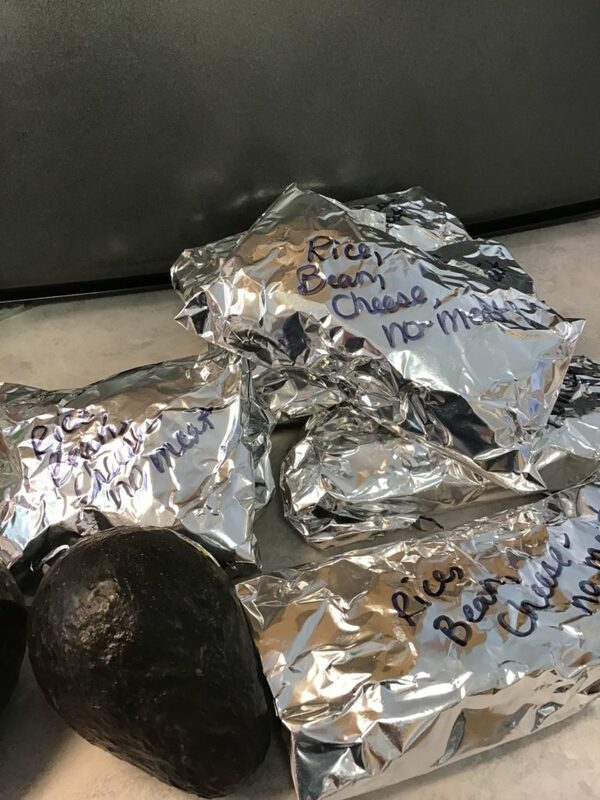 I wrapped this filling in tortillas, then foil, then labeled and froze for quick dinners for Patsy when Rob is home with her and I’m at work. She loves them and ate most of the ones I made a few weeks ago. I made a turkey enchilada from the turkey bits in the freezer. With the 2 casseroles I made this week, I was able to finish that fairly large bag of turkey bits up before they lingered too long in the freezer. The past 2 weeks haven’t been the easiest, but with everyone pulling together, we’ve all been able to eat tasty, healthy, economical meals. This week will have a much lighter schedule. Whew!!! 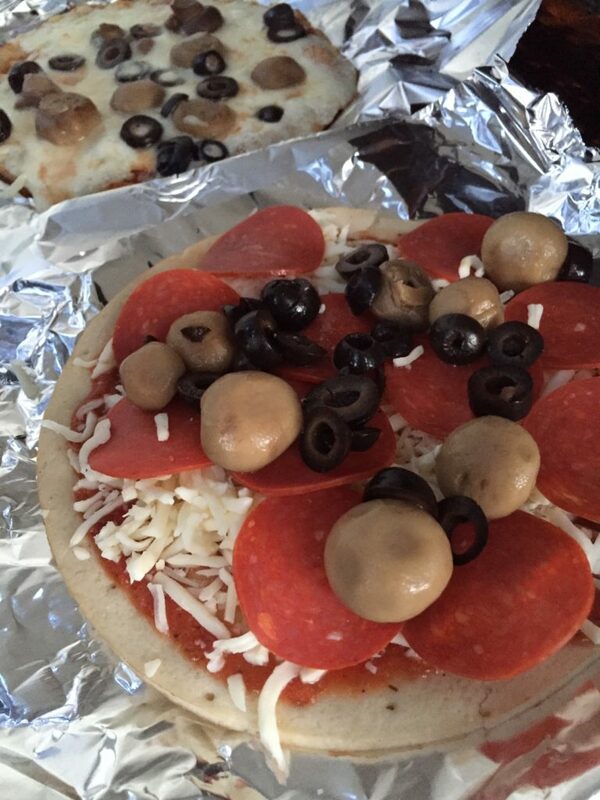 This week, I made gluten-free pizza twice. The first time, it was deep dish combination pizza. I killed part of the yeast by using too hot of water, so it did not rise well. Still, it rose enough that we could eat it, and so we did! 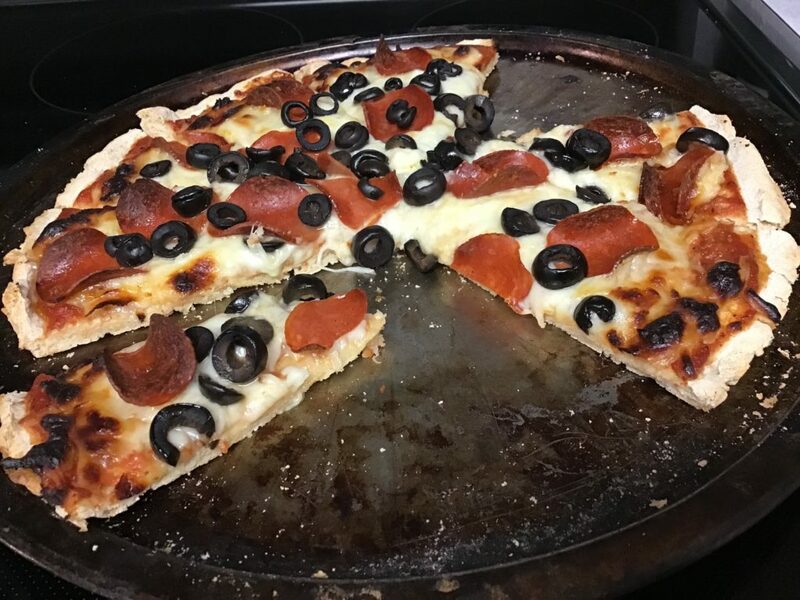 I checked the yeast, determined I was the problem and not the yeast, and made another batch, but this time, I made 2 flat crusts. I par-baked them for 5 minutes at 500 degrees F. and froze them. 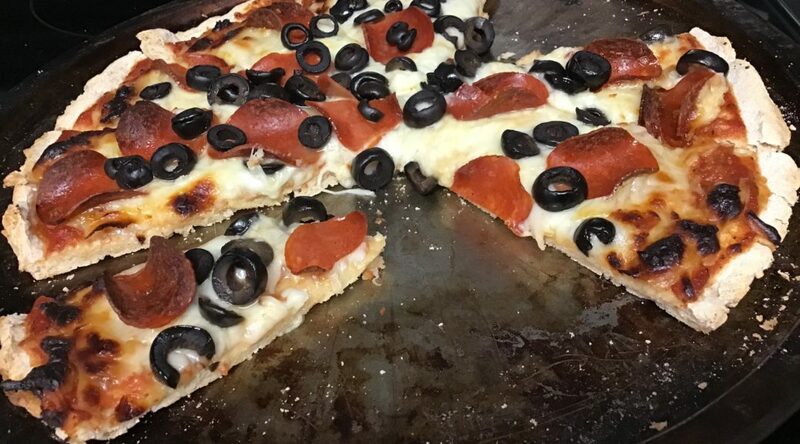 Tonight, I pulled one of them out of the freezer, topped it, and baked for 15 minutes at 500 degrees F.
I also made up a few baggies of the dry ingredients for the pizza and put them on the shelf for another time when I want to make it quickly. Now that I have the recipe working properly, I will post it soon. Rob barbecued some steak. I sautéed some frozen shrimp. I also made turkey-burger meatloaf, which we ate a few times until it was gone. We ate the chicken we got last Friday at Costco, boiled the carcass and made broth, which turned into chicken and dumplings. We ate several kinds of canned and frozen fruit, including frozen blueberries, which Patsy ate straight from a bowl while they were still frozen. She also had smoothies a couple of times and used more frozen fruit in those. 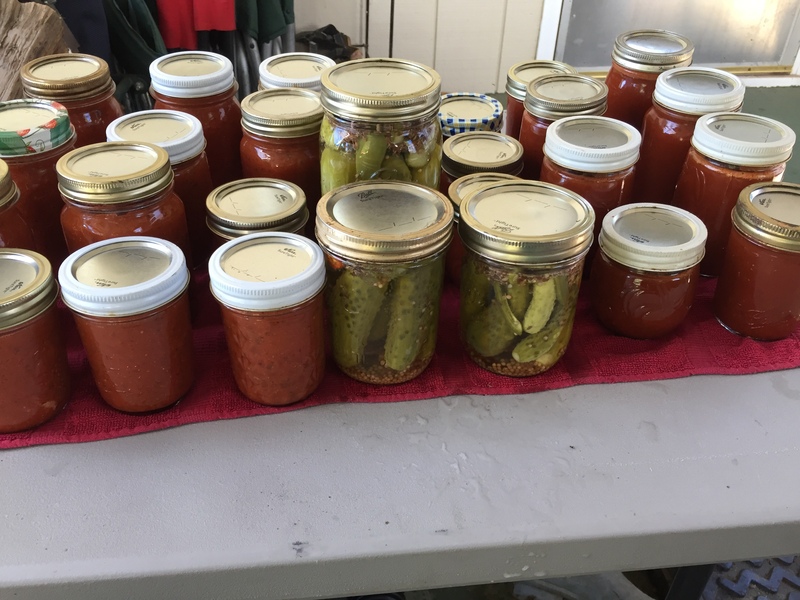 I’m not exactly sure what else came out of all those empty jars that are waiting to be put away in the shop, but I know we enjoyed eating whatever was in them! 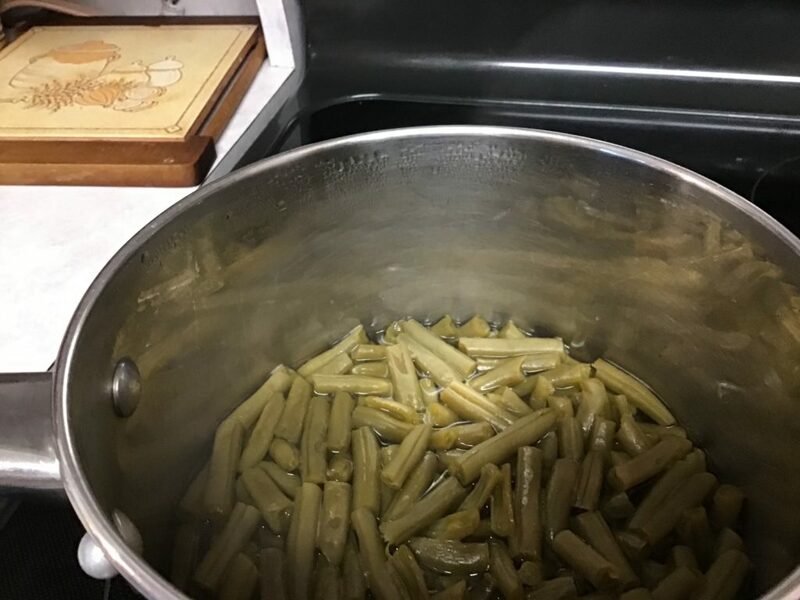 We had home-canned green beans, lots of carrots, and quite a few salads. We had baked potatoes a couple of times and Rob made home-shredded hash browns, too. It was a very busy week, full of medical appointments, working extra time with the kids, and other things we did. 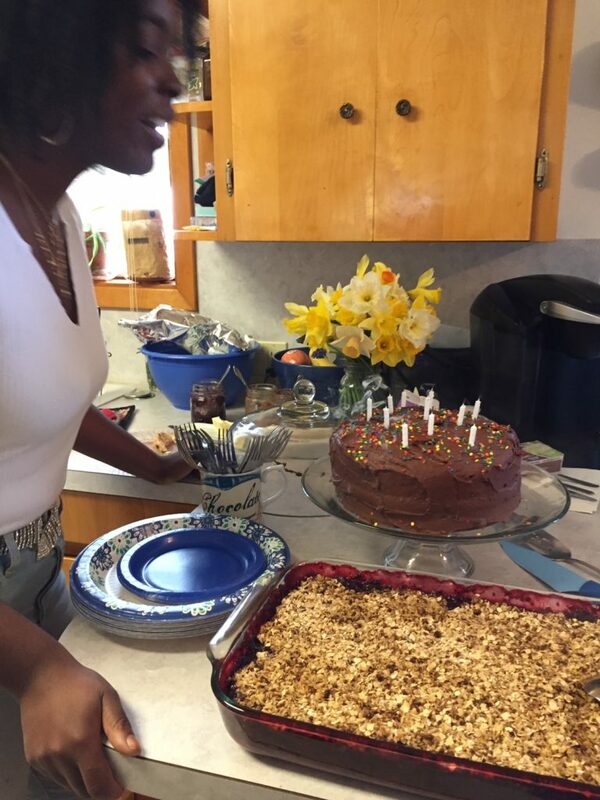 I feel happy that I got as much cooking done as I did and that all of the dishes got done, too! (Rob can’t wash his fair share until after he recovers from one of his medical tests, so I’m merrily washing away. Every day. Every dish. Patsy dries and puts away. By the way, Rob is very, very fine–it was a great result, praise the Lord–and he’s trying not to laugh too loud about having to take a break from dishes and hauling firewood!). Jake and Michaela ate dinner here tonight, and they had cinnamon sugar toast on whole wheat bread. (Under duress, she ate 1 baby carrot and Jake ate 2 cucumber slices) Jake wants to spend the night, but I took Michaela home because she wants to be there. While I was gone, Rob cooked eggs and eggs for Jake, and he topped off his evening with mini-marshmallows, washed down with grape juice. How’s that for a before-bed snack? Hmmm. I hope your meals were less eclectic! At the beginning of the week, we ate leftovers from things we had cooked last weekend. 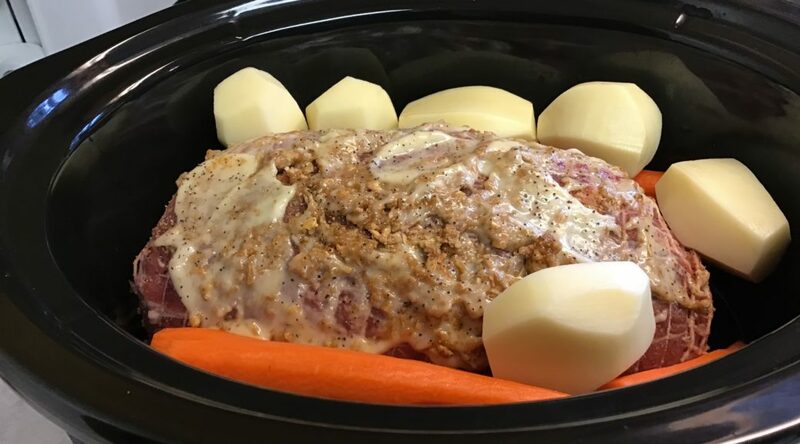 The fridge was starting to look pretty bare of anything that could be grabbed in a hurry, so I cooked a big roast with carrots and potatoes. I put the last of a jar of horseradish sauce, mixed with some powdered onion soup mix on top. It came out wonderful. I went ahead and froze one small container of sliced beef for later, since it was a large roast. 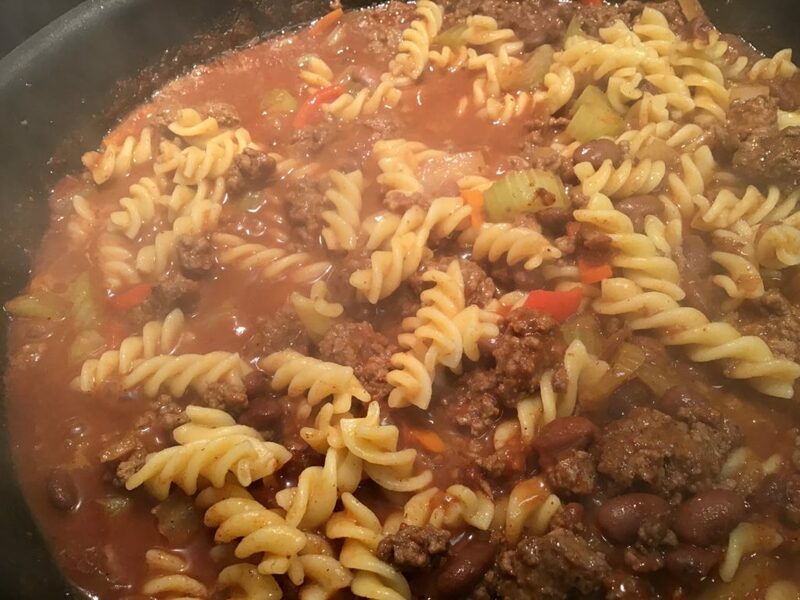 I made some chili-mac with beans I had cooked last weekend, and froze the rest. 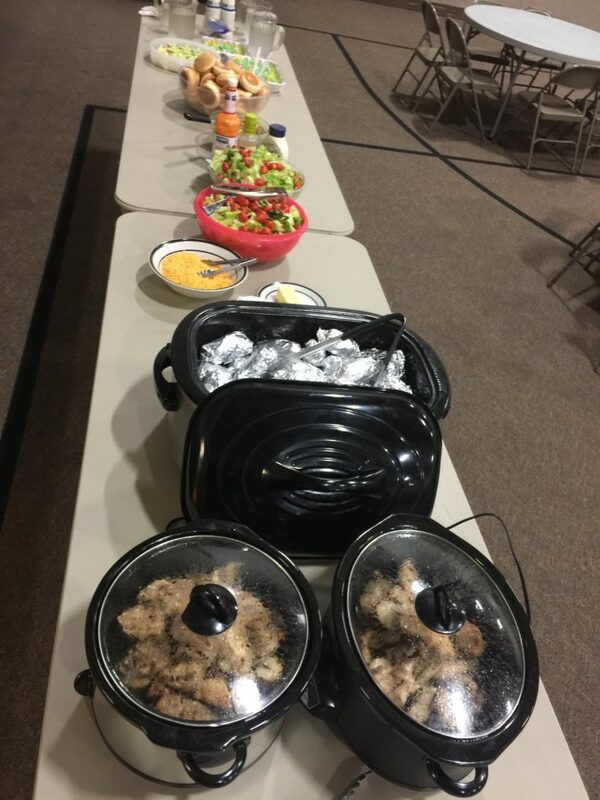 We made taco bar for the college age kids at church. 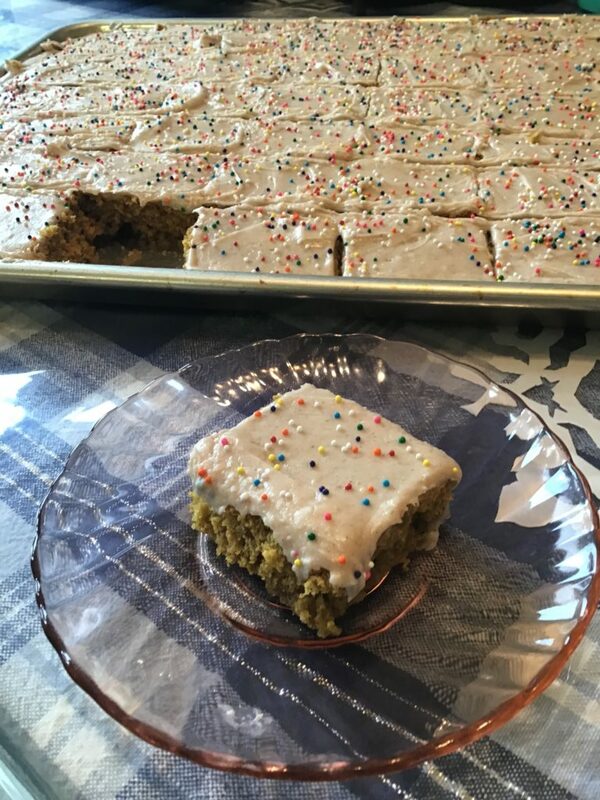 I made a big crock pot of refried beans, and some really, really good Pumpkin Spice Bars. I still have several cans of that pumpkin Rob got for 10c/can over a year ago. I wanted to find a use for one of them, and I know I’ll make the recipe again. We had lots of salads, a sandwich or two, bagels and cinnamon sugar toast for the kids. I made soup on the day my mom came over with a jar of the beef stew mixture we canned last fall, a pint of green beans and a pint of tomato juice. I added some water and spiced and it turned out great. She brought some muffins. I made lemon-poppyseed muffins to put in the freezer for people to pop out for quick breakfasts. 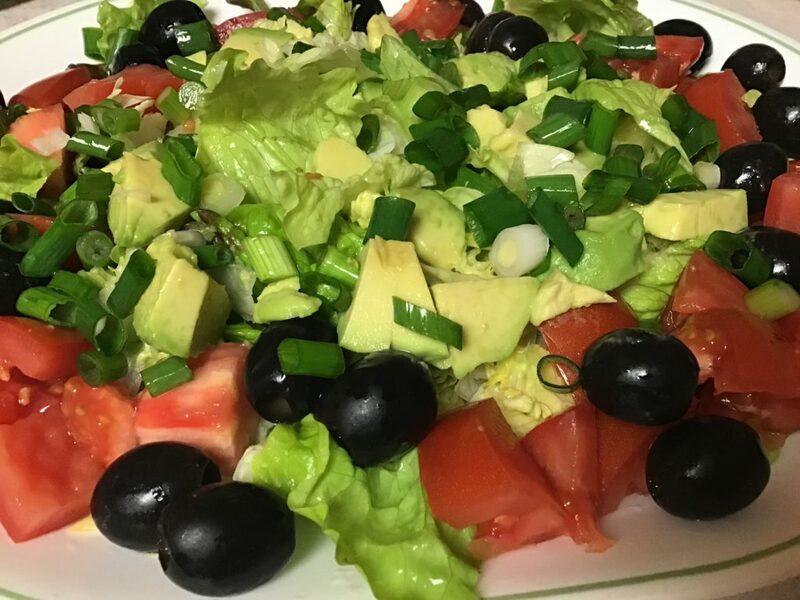 I served lots of salads and veggies this past week. 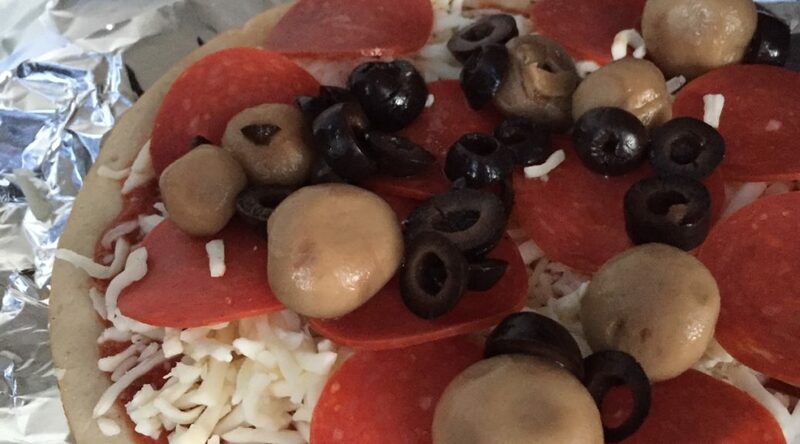 One time, I put it out on a platter and added lots of goodies to make it look different. Somehow, it worked. We felt like we had a whole new kind of salad! 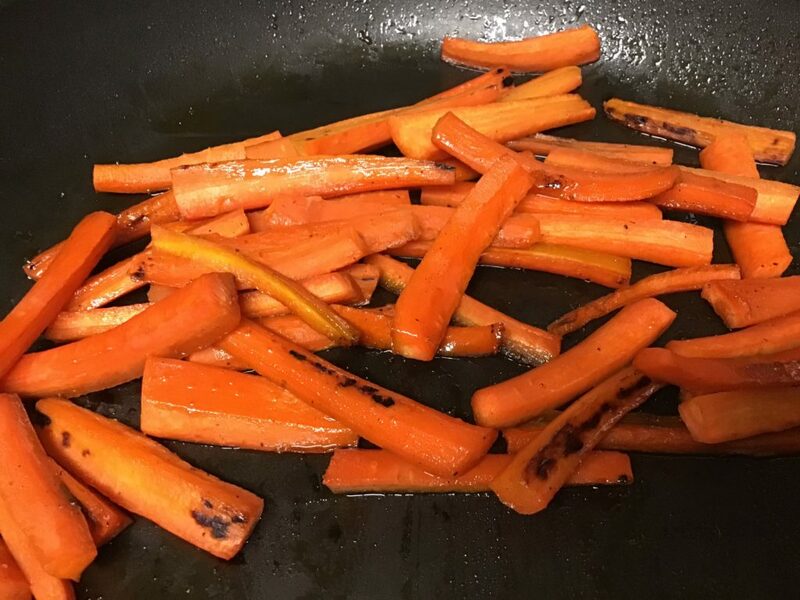 I made carrots sautéed in apple juice. Carrots are one of the most reasonable fresh veggies at this time of year, so we’ve been having them more often. 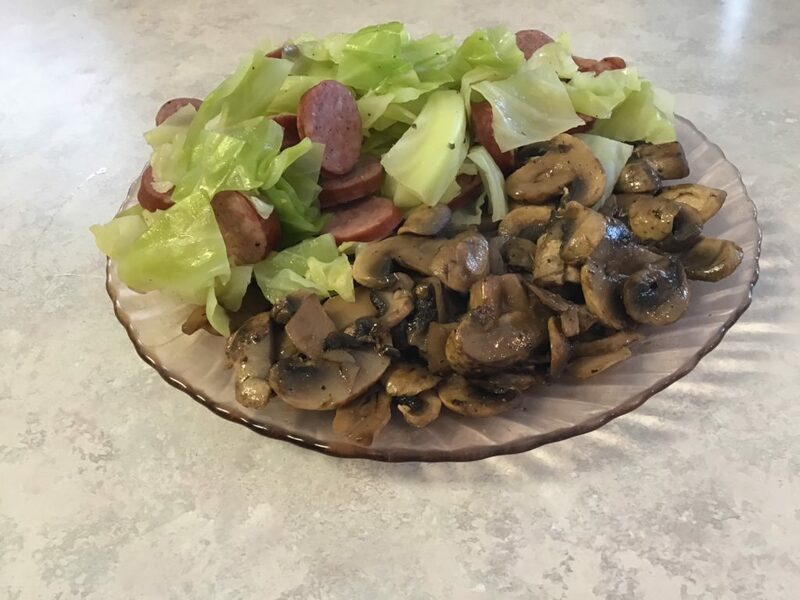 Rob made himself some cooked cabbage and chicken sausage with a side of sautéed mushrooms. The cabbage is also a good price, as it is in season at this time of year and he found 2 large packages of mushrooms on the mark-down rack, so he got to enjoy a bunch of those. We’ve had omelets from the mushrooms, as well. Another day, I made coleslaw from more cabbage. I found a bag of frozen pesto cubes in the freezer. During the summer, I make it and freeze it in ice cube trays, then pop the cubes out and freeze in a bag. 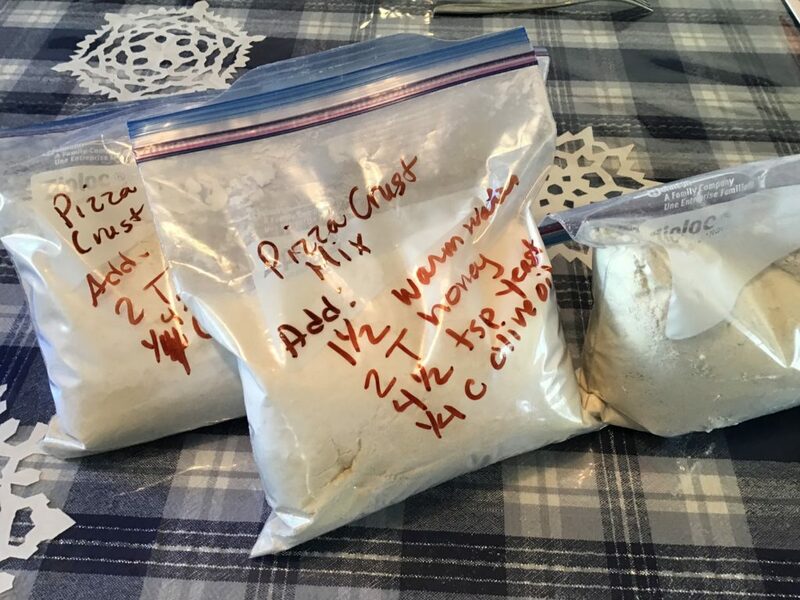 My recipe is very simple–it includes basil, parmesan cheese, garlic, salt, pepper and olive oil. There are no pine nuts in it. 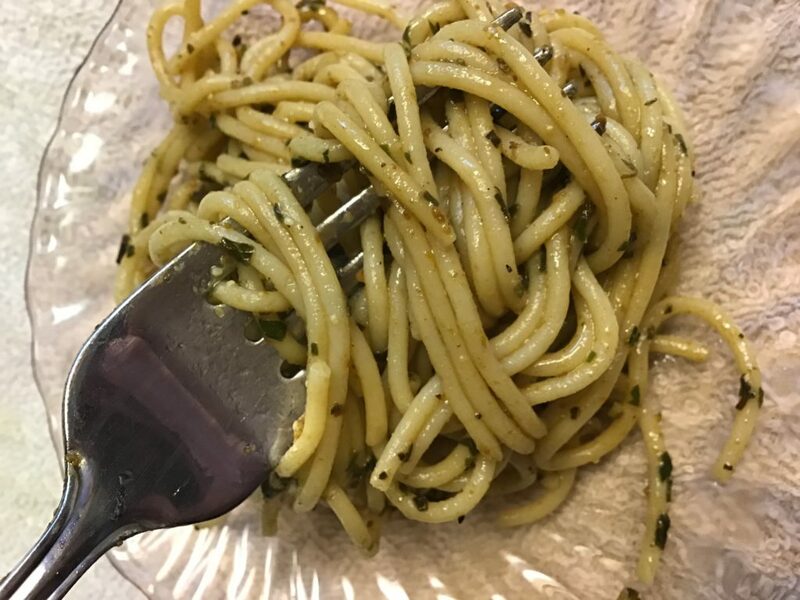 I made brown rice pasta with the pesto last night. It was really good. I ate way too much. 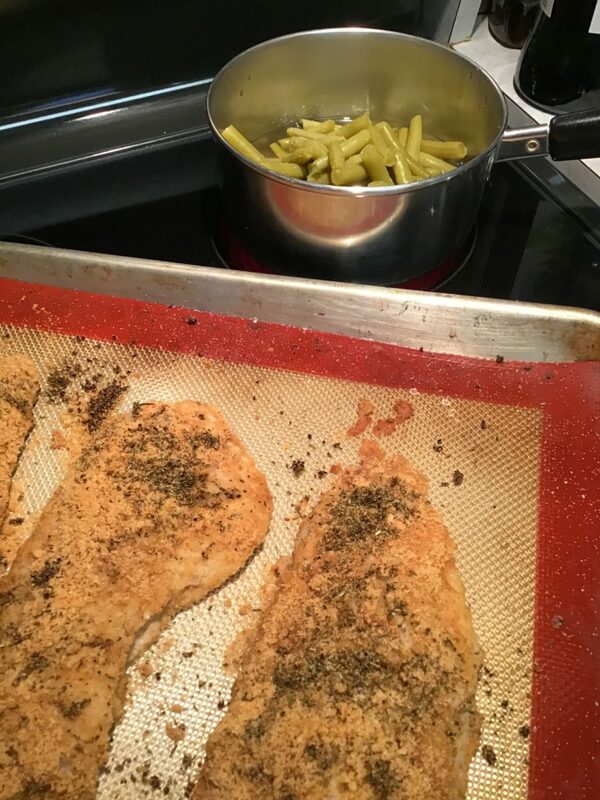 I crumb-coated some rockfish that was in the freezer and served it with the pasta, and home-canned green beans. We ate several jars of green beans this week, several jars of fruit, and quite a few odds and ends from the freezers. I’m noticing that the chest freezer is starting to feel less tightly packed, which is good news since it’s hard to see what’s in there other than the top layer. It’s easier to dig around if it’s not too crammed. The 2 uprights are showing some spaces as well. The little freezer on top of the fridge in the kitchen is still crammed because I keep bringing veggies and things in from the shop for immediate use. 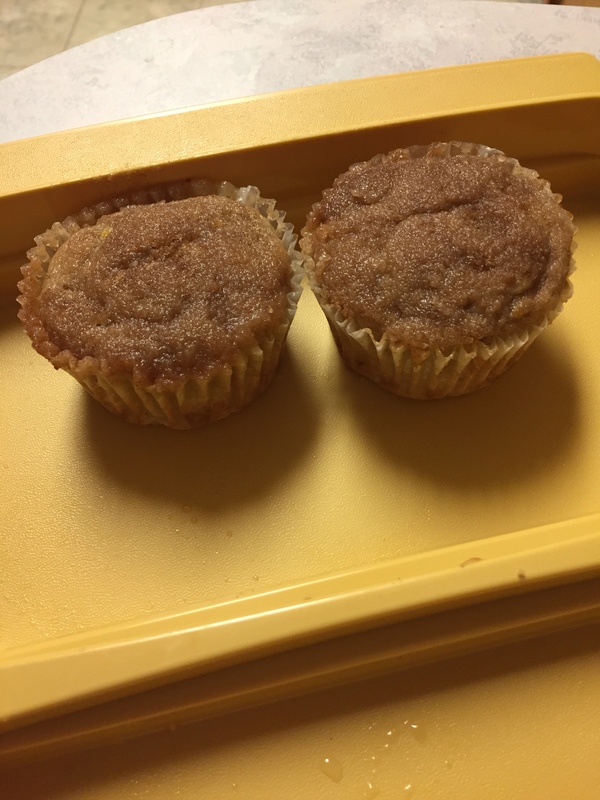 Now that I’m getting more space, I plan to make up a few more things like muffins to have on hand for quick meals. 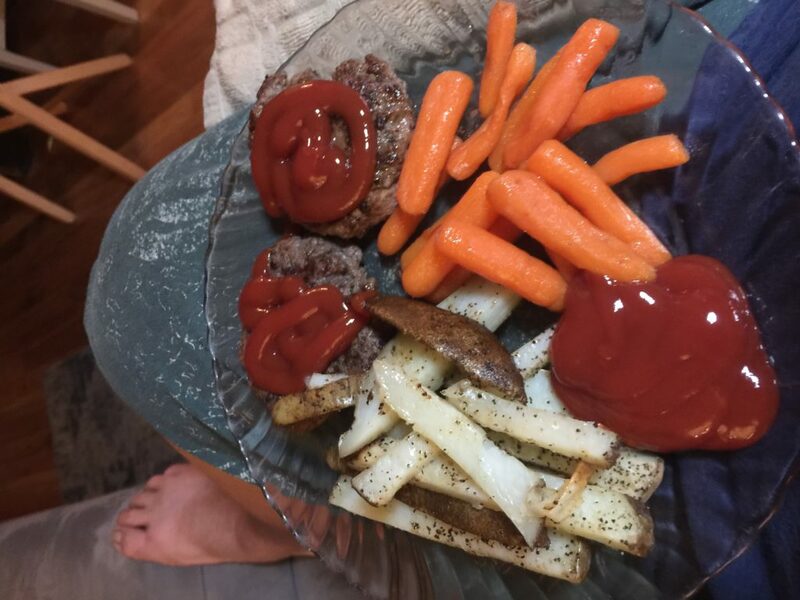 One night, Rob made hamburger patties, baked “French fries” and carrots with a little honey on them. 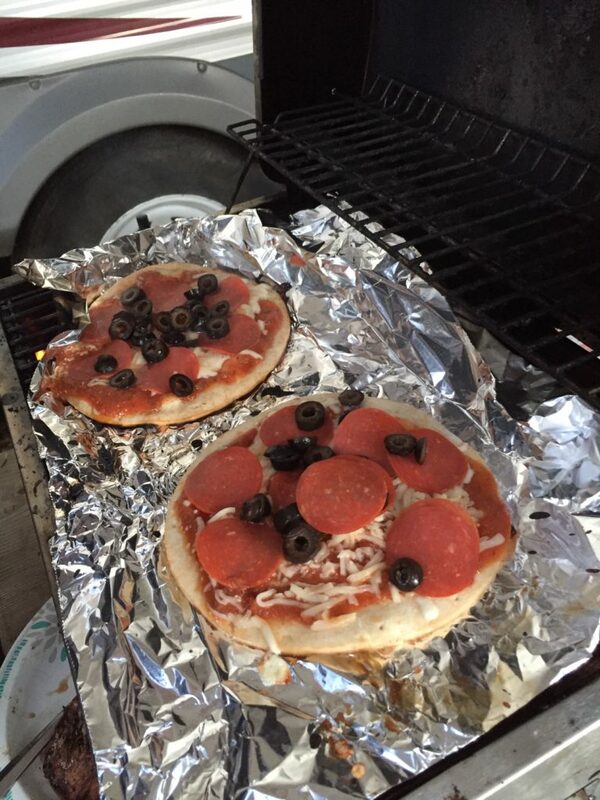 Then, he took a picture of it (that’s his foot and knee there) and sent me a picture with the caption “I’ve got dinner for you.” I was super happy he did that, as I was heading home and was starving:). Patsy made gluten-free crepes. They were really good. Way too good. We’d better not make those too often:). We ate leftovers quite a few times as well. 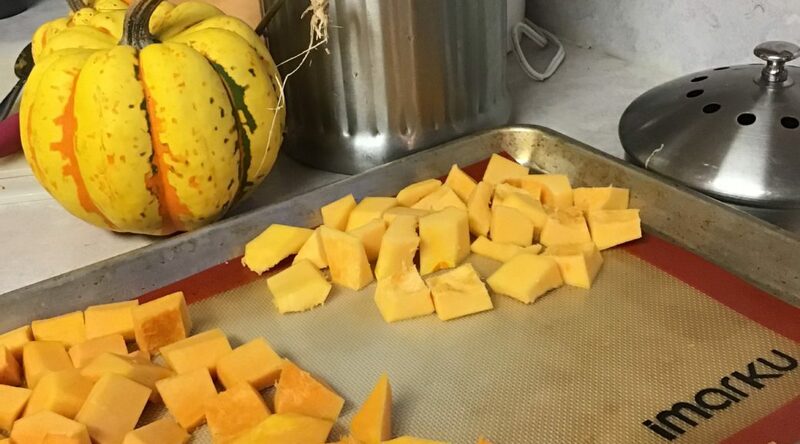 I decided to attack the winter squash that was left from last year’s garden. 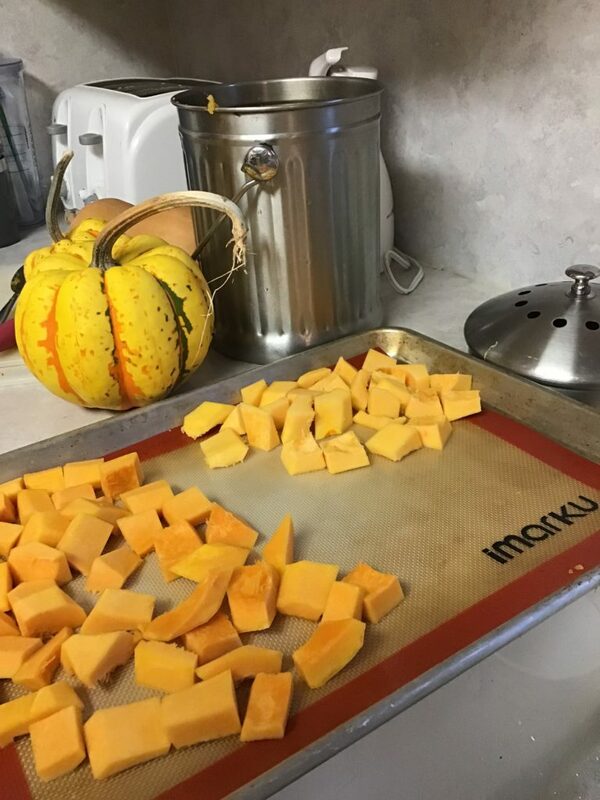 I got such a good crop of my acorn squash, was given 4 Butternuts, and my compost pile grew a couple more all by itself! We’ve been eating it all along, but when I went and looked at my still-large bucket full, some of them were starting to get bad spots on them. 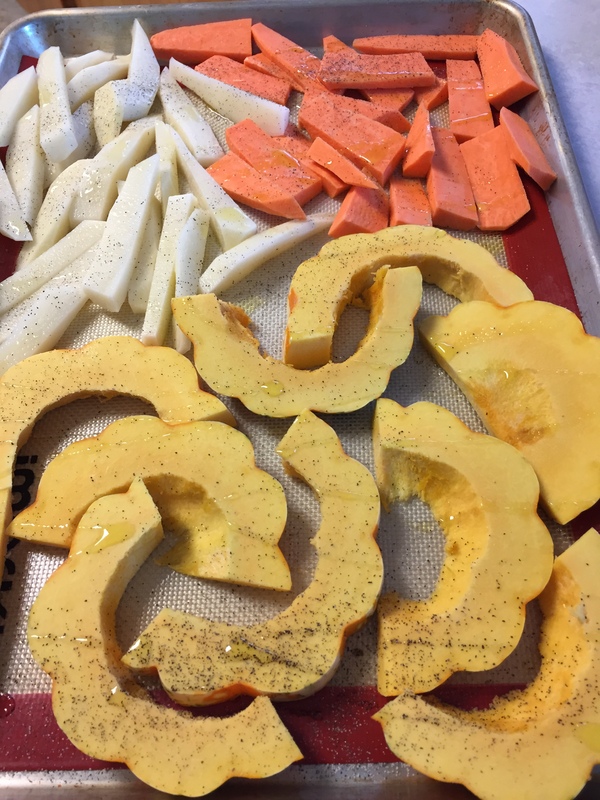 I cut each and every one of them open, threw away anything that was bad, and cut the rest into chunks, which I roasted in a 425 degree oven with olive oil, salt and pepper. I got 2 pans. 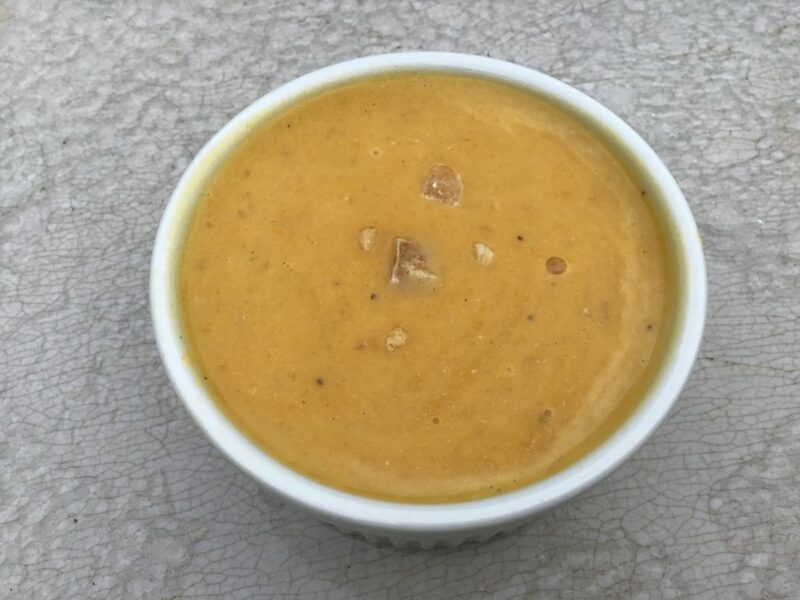 I made ginger apple-butternut squash soup. I found a few apples in a box on the covered porch from last fall. They were a little wrinkly, but still good, so I wanted to target them as well. The soup was very different than what we usually make, but Rob and I both liked it. 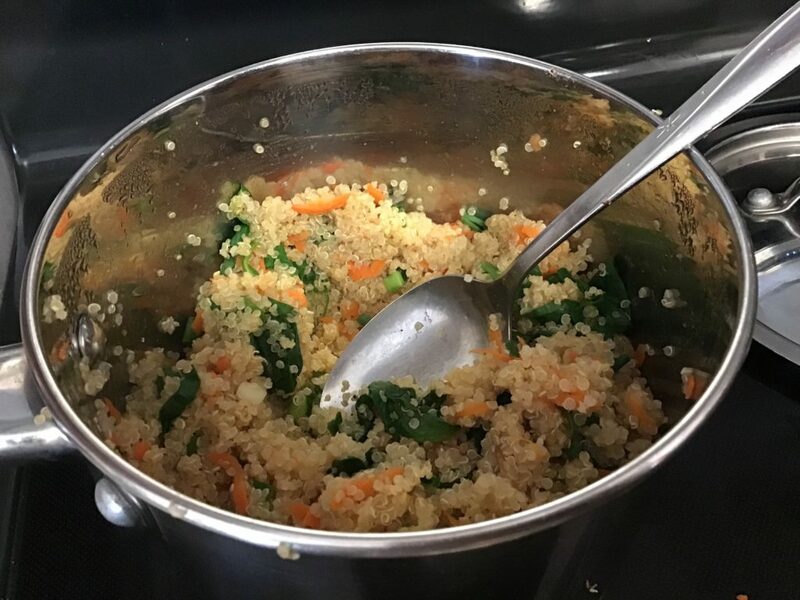 I made quinoa bowls with quinoa, carrots and spinach on the bottom. Pieces of Rob’s BBQ’d chicken thigh meat with a chipotle-lime sauce and roasted squash came next and it was topped with a apple dressing. 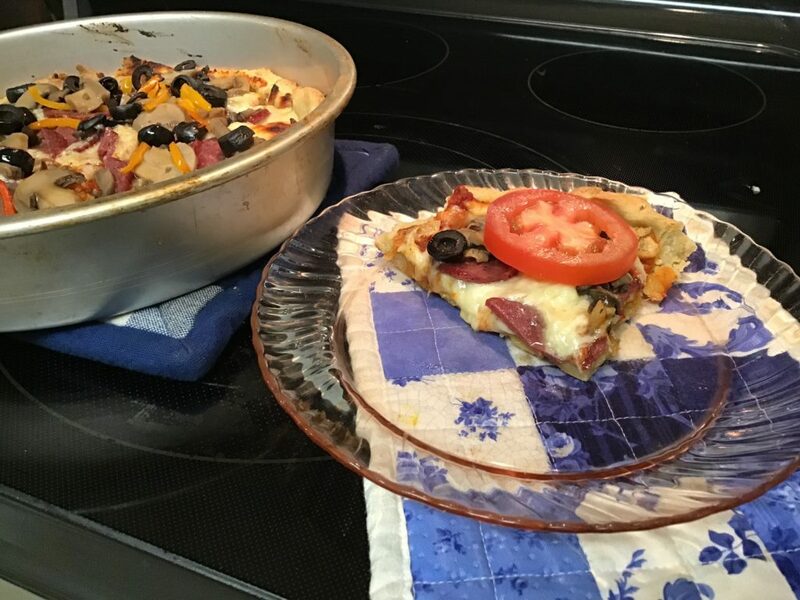 I started with a recipe from Gluten-Free and More Magazine, and changed it up quite a bit. We liked it! We got 10 lbs of frozen chicken hindquarters for $5 last Friday. Rob barbecued the whole bag and we’ve been eating it all week. 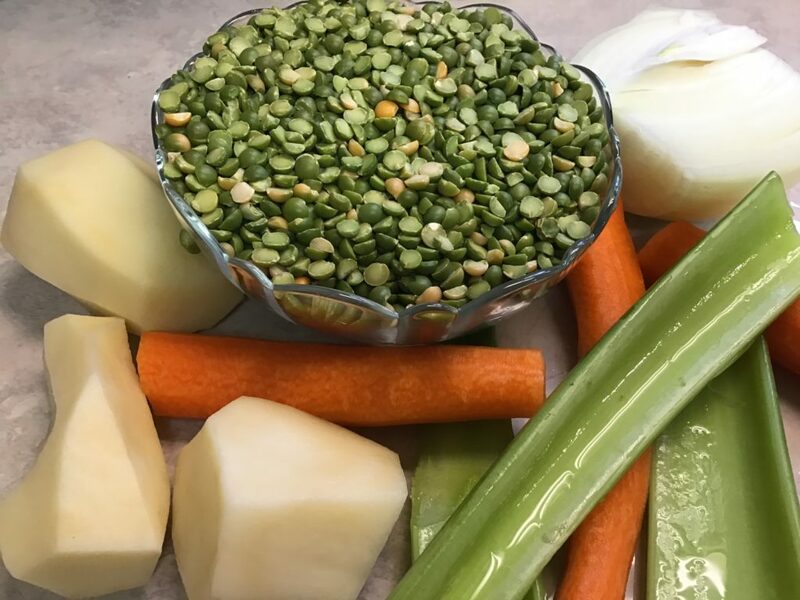 We’ve been pulling things from the freezers and eating them–lots of veggies, odds and end of things, etc. Patsy ate some frozen burritos one night from the ones I made and froze a few weeks ago. I’m going to have to make some more before long. I made a mixture of hamburger and black beans with Mexican seasoning and we had tacos/taco salads one night. One night I sautéed some frozen shrimp that was in the freezer for myself after work. We’ve also had some leftover pork chops from the ones my sister made last Sunday for Family Sunday Dinner at her house. I took leftover salad bar items from what was left when we had our friends over last Saturday. I’ve had to adjust my February plans for food a bit from what I thought it was going to look like last week. I was out of a lot more things than I thought I was. So, I will not be saving grocery money this month. I will be spending every cent of my grocery budget, and perhaps a bit more. I’ve already gathered several kinds of gluten-free flour from the store, and my mom gave me some almond flour she was not using. (Thanks, again, Mom!). We’ve used a LOT of produce and I will be getting more weekly. I already got baking powder, baking soda, and 5 pounds of butter. I still need to get bulk spices, salt and pepper–you see how it is:). I went ahead and grabbed “Michaela and Jake” foods as the kids are spending next weekend with us and froze the things like bagels and ww bread. I feel like my January use-it-up project was very successful and the goal of rotating my stocked food was met. 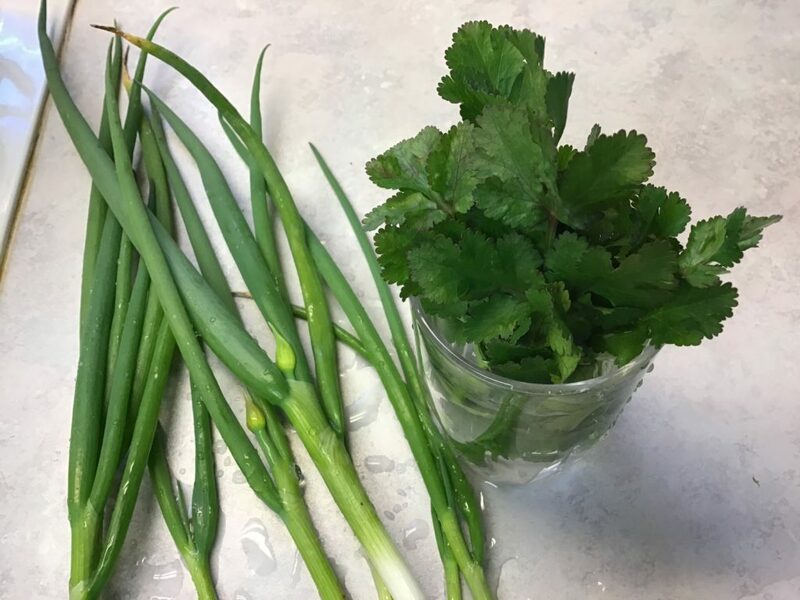 I don’t mind buying more to keep the pantry full, and it’s nice to know that things are staying fresh out there. I plan to keep digging into the cupboards, freezers, and pantry and will continue to use up older things that are there. I will still attempt to do the weekly post about our menus and showcase the items I am using up. Best of all, Rob continued to lose weight over the month and my blood sugars are a bit better than they were 3 months ago, even with the challenge and the holidays. I tried a recipe for French Onion Chicken. It was from Cooking Light magazine, but I did tweak it a bit. First, you cooked a lot of onions. I used a little bit of butter, a small amount of beef broth, and about 4 huge onions and used a non-stick pan. I used even less butter than the magazine called for and no cooking wine. They got nice and cooked in about 15 minutes. I put 1/2 of them on a baking tray, and the other 1/2 I used to make some French Onion Soup. 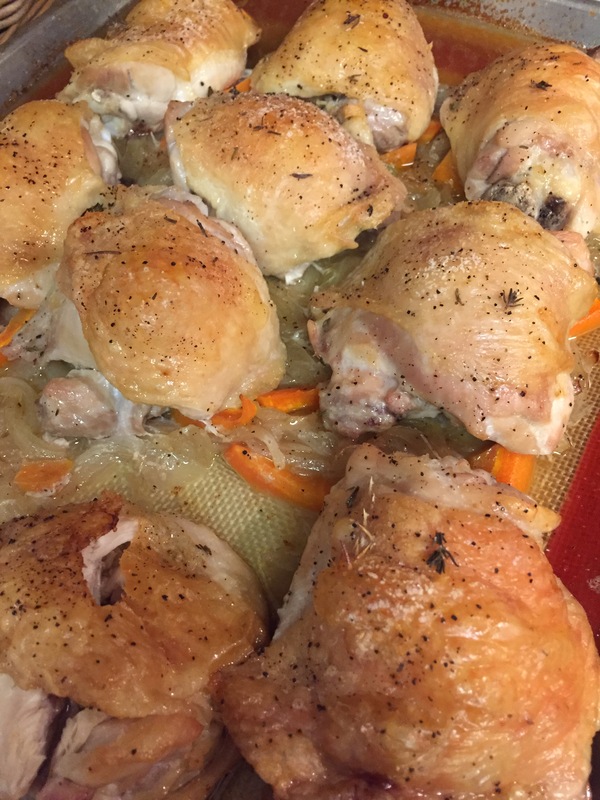 I used chicken thighs I got on 30% off instead of the whole chickens that were called for. I put down a layer of cooked onions and some carrot sticks (my addition) and laid the thighs on top and sprinkled them with fresh thyme. I did not make herb butter and put under the skin, although I’m sure it would be delicious. We don’t need those extra calories around here right now. I decided to set my oven at 425 degrees. That was hot enough for me, even though the recipe called for 450. Then I baked them until they were done, about 40 minutes. 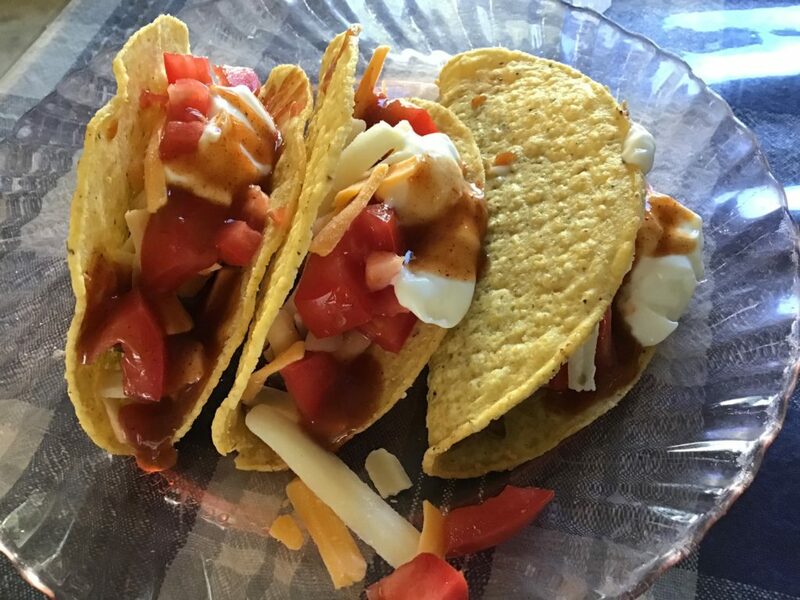 (They were not super cold as I had returned from the store and made them a little while after that without putting them in the fridge for hours as would normally happen.). They were really, really good. I made French Onion Soup with the other 1/2 of the onions. It was good with little pieces of bread (some regular and some gf) with cheese slices melted on top. I made another batch of zucchini muffins, with a cinnamon-sugar topping. Everyone liked those! 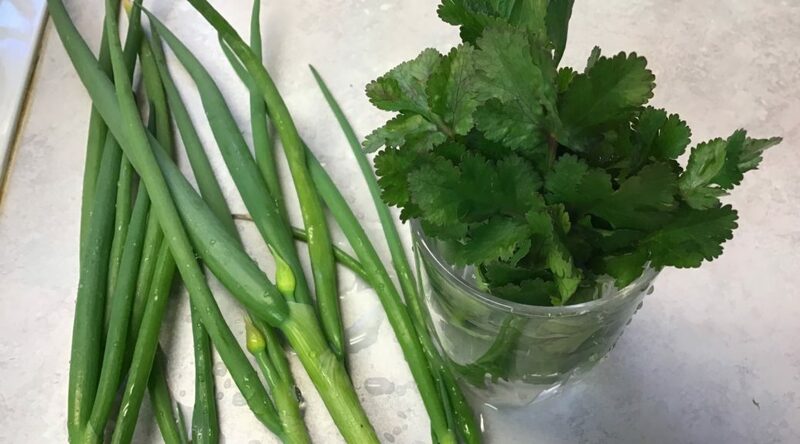 We have had lots of vegetables–tons of salads, canned green beans, carrots, cherry tomatoes, etc. 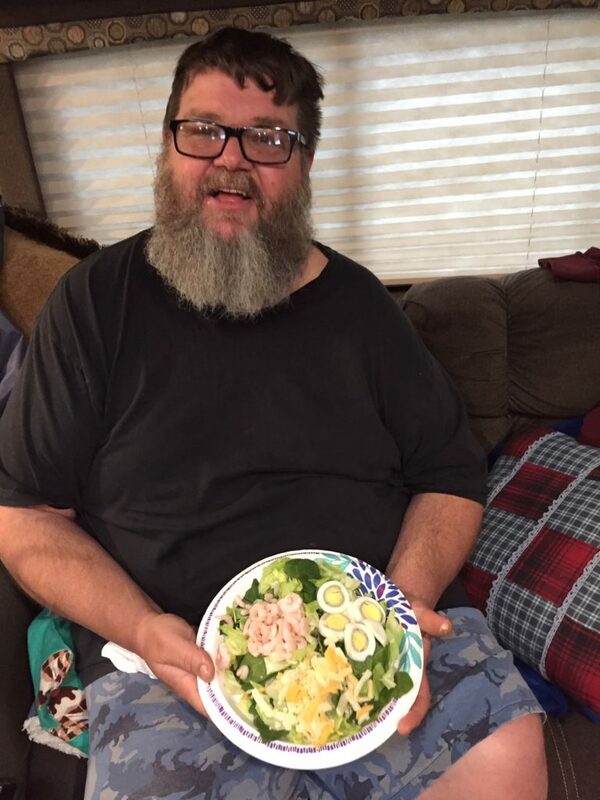 My aunt gave us some low-calorie salad dressing that Rob has been loving. 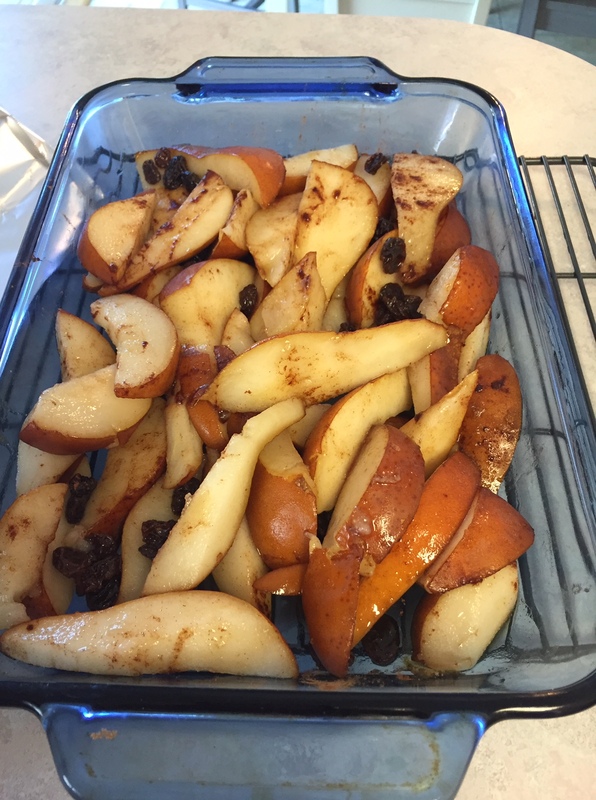 I made baked pear slices with cinnamon sugar and raisins. They were great! I went out to breakfast with a couple of friends, and had an omelet. It was good. I ate half for breakfast, and the other half several hours later for a late lunch. We ate many other things, of course, but those were the most exciting ones! This week, I was able to get enough tomatoes for both pasta/pizza sauce and taco/enchilada sauce. I’m super happy with the flavor of both. I was surprised with more cucumbers when I looked under the bushes that really look as if they are dying. So, I made more spicy pickles because I also found a couple more jalapeños and Serranos on those bushes. 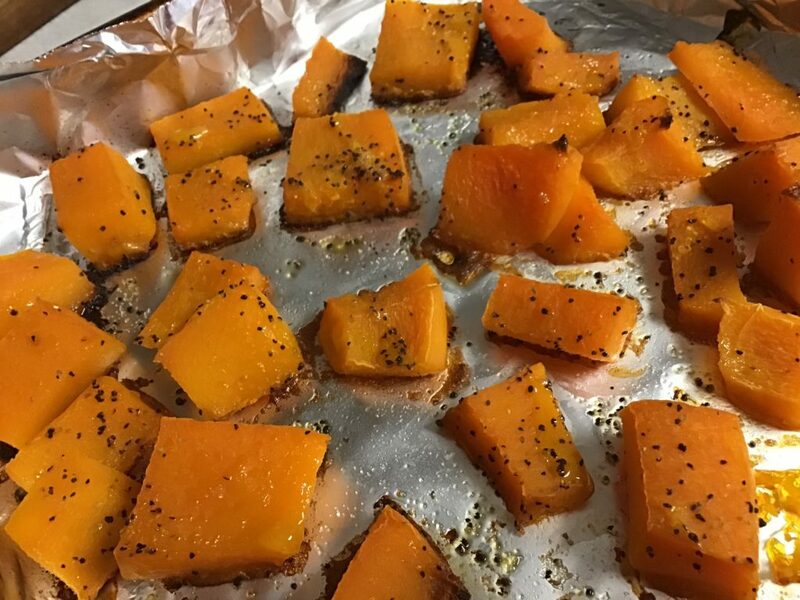 One night I roasted a pan of sweet potatoes, white potatoes and acorn squash. They all turned out great. The Carnival acorn squash plant has been prolific and I just keep taking the biggest ones that look the most mature, and using them. This is the 3rd one we’ve eaten so far. There are quite a few left out there. Some probably won’t mature, but several will. We have had chicken with plum sauce twice. Since I made a new batch, and there are enough prunes to do it again if I get around to it, I am glad that we are finding a way to use it in such a tasty fashion. We are still eating zucchini, although I’m happy to report it has slowed down to a manageable level. 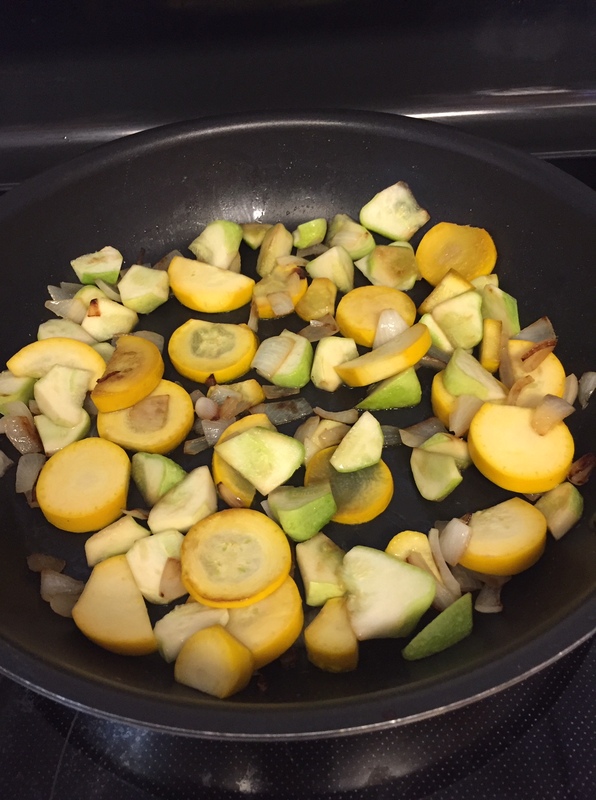 It is nice to saute some zucchini with onion until just crisp-tender. 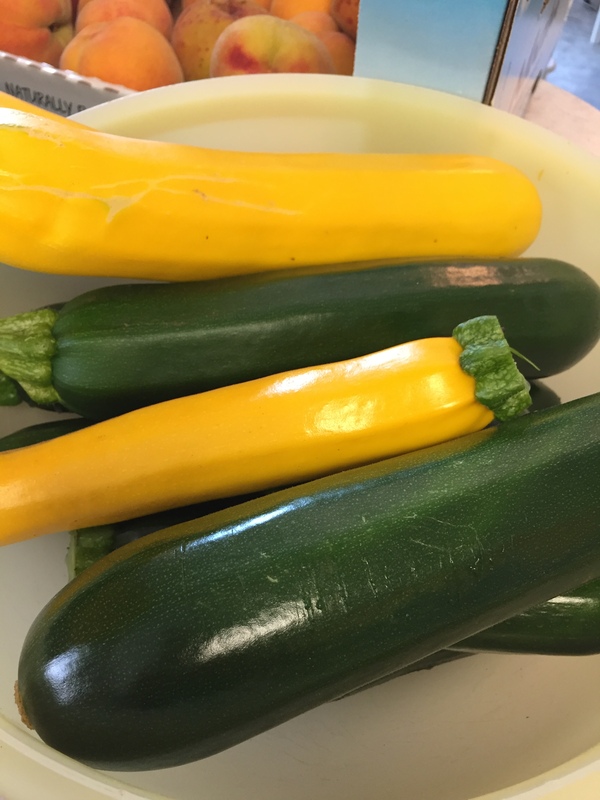 This is an old picture, so it doesn’t show the yellow crookneck squash, or the scallopini squash or the round ball squash that came up from the few seeds I planted from a summer squash mixture in early August. The old plants are about done, and will probably die before long, so it will be nice to still have a fresh veggie when that happens for a few more weeks. I had Eritrean food with Harnet one day. Danait was proud as can be of her bike-riding skills. 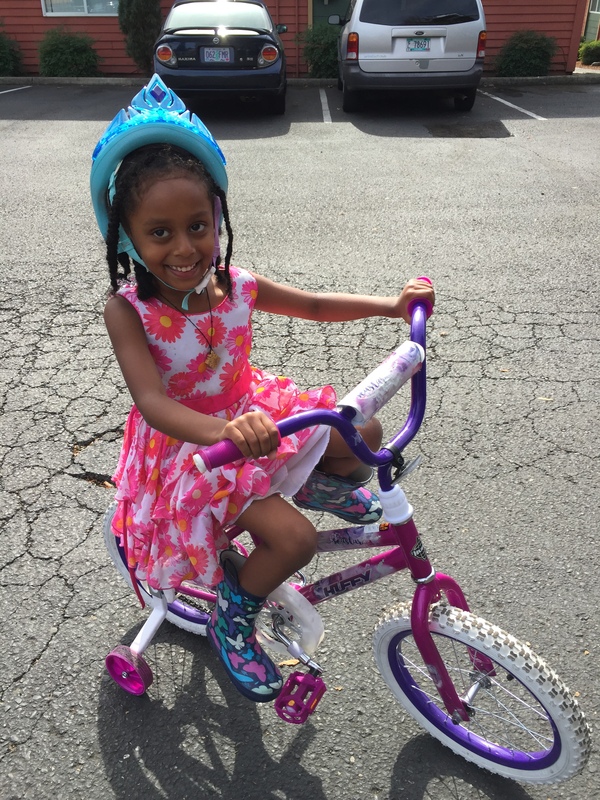 The bike and helmet were birthday gifts back in June, and she has improved a lot. Since the only place she can ride is the parking lot of their apartment complex, there is a little routine they do, so I had to do it, too. It consists of her riding off quickly, with the grown-up chasing her, all the while looking for stray cars and cats (there might be one, you never know!). She was telling me they do it 3 times some days. I was done at one trip around their course:) It was a good workout. Lunch was great. 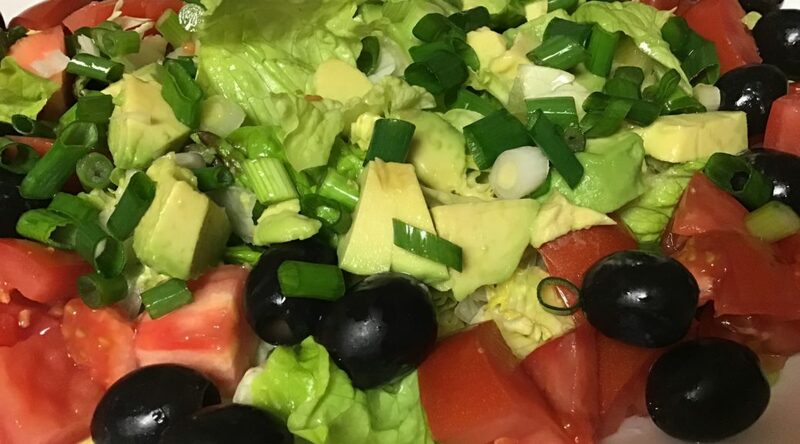 I took a salad to add to the food Harnet cooked. Of course, she sent some home. This time it was the red lentils she likes to make and some rice with mixed vegetables in it. The girls here at home have been eating it as taco filling. I got some pork cutlets on mark-down last week, so we used them this week. Rob grilled them after marinading them for a while in one of his concoctions. They were delicious. We ate lots of salad, piles of tomatoes, some canned and fresh fruit, a few potatoes, and some other side dishes. It’s going to be harder to plan dinner when the garden dies, but it’s still limping along for now. I’m glad. It’s an awesome time of year when I have so much fresh produce.